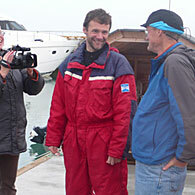 Board member Sven Huseby (right) interviewing a Norwegian scientist as part of a forthcoming film. In a recent blog entry for The Daily Green, a new Web site from Hearst Magazines, Scenic Hudson President Ned Sullivan wrote about a new film about the dangers of ocean acidification by Barbara Ettinger and board member Sven Huseby. "Backyard Matters" by Scenic Hudson President Ned Sullivan is a regular monthly feature on TheDailyGreen.com. 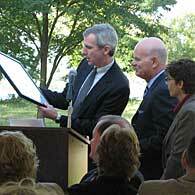 Scenic Hudson President Ned Sullivan honoring Steve Saland at a Sept. 5 waterfront breakfast. Read more about Thank You, Senator! BEACON – At the Greater Southern Dutchess Chamber of Commerce breakfast on Sept. 5, Scenic Hudson saluted State Sen. Steve Saland for ongoing support of revitalizing Beacon's waterfront and its connections to the Main Street business district. The breakfast meeting was held at Long Dock Beacon, the 25-acre waterfront site where Scenic Hudson is seeking to turn a pollution-scarred parcel into a world-class "green" hotel/conference center and park with numerous public amenities. President of Scenic Hudson since 1999, Ned Sullivan has directed the organization through a period of dramatic growth in its regional impact. Today Scenic Hudson is recognized as a regional and national leader in its field, recipient of the Eleanor Roosevelt Val-Kill Medal in 2007 and the Land Trust Alliance's National Land Trust Excellence Award in 2011.